Outdoor Adventures This Year Included Sleep-Away Camp with Manhattan Youth and the Appalachian Mountain Club. For most of our students the wilderness consists of a schoolyard or city park. Sophie Gerson believed that all city kids need to fully experience nature and the great outdoors. SGHY arranged for two boys and two girls to join with Manhattan Youth, one of our city’s top quality youth service providers, for some real outdoor adventures. 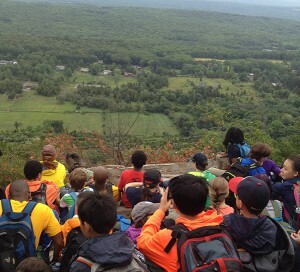 For a week, four students were immersed in camping, hiking, swimming, and viewing deer and bear on the rural New Jersey grounds of the Appalachian Mountain Club – along with a side trip to an amusement park. It was fun and I had a chance to do activities I would never get to do in NYC. The counselors were very nice and I learned how to rock climb and hike in the woods, where in NYC there are no woods to hike. Tagged Appalachian Mountain Club, camping, Healthy Youth, Hiking, Manhattan Youth, Sophie Gerson, swimming.